RDBMS is the acronym for relational Database Management System. The Concept of relational is known since 1980’s but the idea of Database Management System is Define quite old. The most famous RDBMS packages are Oracle, Sybase, and Informix. As mentioned before, a relational database is based on the separation and independence of the the logical and physical representations of the data. This provides enormous flexibility and means you can store the data physically in any way without affecting how the data is presented to the end user. The separation of physical and logical layers means that you can change either layer without affecting the other. A relational database can be regarded as a set of 2-dimensional tables which are known as "relations" in relational database theory. Each table has rows ("tuples") and columns ("domains"). The relationships between the tables is defined by one table having a column with the same meaning (but not necessarily value) as a column in another table. There is an implied relationship between these tables because emp has a column called dept_id which is the same as the id column in dept. In Oracle this is usually implemented by what's called a foreign-key relationship which prevents values being stored that are not present in the referenced table. and outer-join which is a combination of intersecting and exclusive or ing. The intersection or join between 2 sets (in this case, table) produces only those elements that exist in both sets. Therefore, if we join Emp and Dept on department id, we will be left with only those employees who work for a department that is in the dept table and only those departments which have employees who are in the emp table. The union produces the sum of the tables - meaning all records in Emp and all records in Dept. and this may be with or without duplicates. The union operator is only allowed when the number and data types of the columns in the 2 sets are the same. It is not normally be used to combine sub sections from one or more tables rather than entire tables. There are other operators and variations but there isn't the space or the time to provide full details in this short Oracle tutorial. The later versions of Oracle (Oracle 8, Oracle 8i, Oracle 9i and Oracle 10g) are support both relational and object-oriented features. The relational features are more prominent at the moment, but this is beginning to change. In this context an object has both attributes and methods (programs stored with the object that performs a certain action or task) and in a true object-oriented database would belong to a class and would allow multilevel inheritance. A Relationship is defined as “An association among different Entity Sets”. The object-based logical model can be defined as a collection of ideal tools for describing data, data relationship, and data constraints. 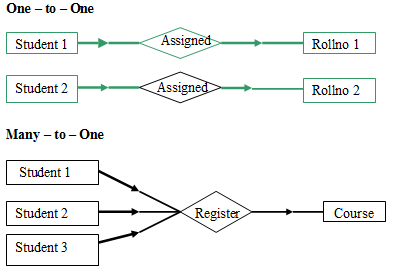 The record-based model describes the data structure and access techniques of a DBMS. File management system, hierarchical database system, and network database system, relational database system are the types of record-based logical models.